There are certain areas in my home that I revisit to declutter over and over again as I get more ruthless and am willing to part with more things. Some of these areas require periodic decluttering because they house perishable items that end up past their used by dates and need decluttering. So this week’s mini missions are going to consist of decluttering areas in your homes that match areas I keep revisiting in mine. Monday – Declutter something from the kitchen ~ One day I will finally get to the point where there is nothing left to declutter from my kitchen but for now I keep plugging away at it. Tuesday – Declutter out of date items from your first aid kit ~ Replace the item if necessary but I find that things that go out of date in my kit are things that never get used so perhaps they just don’t need replacing. Wednesday – Declutter something from the bookcase again ~ I don’t just keep books in my bookcase so I have several item choices in this area. If that isn’t the case for you I am sure there is one of two books that could be culled. Thursday – Declutter something from your garage, basement or attic ~ These areas are often holding places for all sorts of things some useful and used some forgotten and unnecessary. Time to clear out a few of those unnecessary items. Friday – Declutter your socks and underwear drawers ~ I don’t know about you but I tend to wear, wash and put these items back over and over and then when things start to wear out I avoid them and then they just languish in the drawer for months. So every now and again I do a little declutter. Some items I might replace but only if I don’t already have too many. Saturday – Declutter, from your closet, this season’s clothes that haven’t been worn ~ It’s almost August so if you haven’t used clothing items for this season by now you probably never will. Sunday – Declutter your craft/hobby area whether your choice of pastime is anything from woodwork to papercraft, sewing, knitting, gardening or even some kind of sport. ~ Even though I have done the bulk of my decluttering in my craft area it is still under constant review. 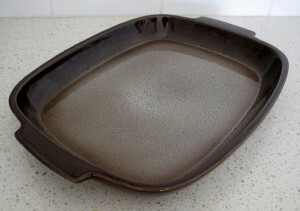 This baking dish has rarely been used in twenty five years. It has survived the cut until now for two reasons 1. because it was a wedding gift (lame reason) and 2. because it was hiding in an obscure spot in the bottom of a kitchen cupboard (the more likely reason). It was unearthed during my attempts to update our inventory. There is nothing like having to write a full inventory of what is in your home to encourage you to declutter stuff. The less there is the less you have to list. Utilise those plastic containers in your kitchen cupboards instead of using cling wrap and plastic bags. I was reading through the list of what to declutter each day and saw the one for the First Aid Kit. It suddenly hit me that we have one under the seat in our car. It’s probably 8 years old and I do’t think we have ever used it. Haven’t checked it either. Out of sight, out of mind. It will be opened and cleared tomorrow. I like your statement about being willing to let things go. I find that clutter is like an onion, it needs to be peeled back layer by layer. As we get to the next layer and live with it a while we are better able then to see the clutter and know what is used and not used. I really appreciate this blog as it has helped me more than any other. I may not do the same mini-missions but the encouragement is just what I need to keep going. Currently I’m working on my sewing and craft room. HUGE job and one that feels overwhelming; but by taking it piece by piece I am getting it done. Also I find that actually completing something helps me move forward. By completing I mean: deciding to get rid of something, removing it from the area and then taking it to the thrift store, putting it in the trash or otherwise getting it out of my house allows me to move on to the next thing. Every little piece frees up some space both in my house and in my mind. Keep up the good work. I went through the First Aid Kits in both cars last week , also the house one and the medicine basket and also the dogs’ (two of them) medicine basket and was suprised to find numerous expired medications( past their use by date). I had a little stash of worming tablets which came free with their flea and heart worm treatment but nearly all had expired .Also “cold and flu “tablets and emergency aspirin – all expired .So that’s another reason to check . I fully agree, Jez– I too am a medical professional and toxicologist—and I am concerned that the article didn’t also mention acetaminophen (Tylenol or Paracetomol, depending on your location) can be very toxic if expired. In fact, it is the classic, textbook example used for either expired drug/overdose causing liver failure. I go through our medicine every 6 months. I am sure that some of the things are still just fine, but I prefer not to take the chance. Every one has to live with the consequences of their decisions whether it is to save money and have prescriptions that are a bit outdated or to spend the money for the peace of mind, not having to worry whether it is ok to use or not. People eat outdated food that is a few years past the date on the cans in some cases. I know someone who has dried bananas from 24 years ago that she eats. She also eats home canned tomatoes that are almost 20 years old. She hasn’t died yet, but I personally wouldn’t do what she does. But, as I said before: we live with the consequences of our decisions. As long as we are happy with our choices, then that is what matters even if other people wouldn’t do the same thing. These mission Mondays are an easy way to declutter the small stuff. Thanks for the ideas! Thank you Anita, this is the authority to make my nut bag claims justified! We have to scrap bandages and the like in the office after a use by date – I mean there’s no adhesive, I don’t see the fabric breaking down, but still I must toss them! Frustrates me SO much, so thank you for the article! Well, I finally did it. I hauled every single canning jar up from the basement, sorted them and then did a reality check. I packed up those of sizes and styles I actually use and then gave the rest to a friend who will use or distribute them. I’m less likely to starve with grateful friends than with a basement full of EMPTY jars! Another ‘just in case’ pruned back to reasonable size. Monday done – That old veggie peeler that I broke two years ago finally made it into the trash can. No Amanda, you can’t fix everything. Tuesday done – Everything is within expiration date, except for one bottle of cough syrup. I usually end up using nearly an entire bottle for a session of being sick (when I get sick, so does the bf), so we keep one bottle around to get us through the first night/until we get to the store. Wednesday and Thursday – No bookcases, attics, or basements :/ I think I’ll see if I can find something else. Friday I’ll have to take a look. I culled socks recently, but the other drawer…. we’ll have to see. Meanwhile, I keep trying to use up the mini shampoos and lotions I have. Monday – Declutter something from the kitchen. While I love my garlic press (a “cleaning” tool came with it…similar to a brush), the garlic roll (used to de-skin the bulbs) works great, but a pain to clean. Tuesday – Declutter out of date items from your first aid kit…after I tried shredding my thumb with the cheese (and then bandaged it) this past Friday, I tossed the expired items from our kit as well as a few toiletries from the main bathroom. Thursday – Declutter something from your garage, basement or attic…no basement, no attic. Our garage has our main “staging” area, hubby’s tools, stuff that stays with/in the house when we move (we rent…don’t ask…it’s an Italian thing), outdoors stuff (camping stuff, etc. ), stuff that won’t work in our temp home but will go with us until we find our “forever” home (not sure when that will happen since I think I’m part gypsy…LOVE moving. Love it enough that we’ve lived here 3 years & I got the “itch” last year. Signing the required 3/4 year lease made me nearly hyperventilate….another requirement here for Americans that are temp b/c of hubby’s job). This area will be empty come spring when we move…unsure where yet since they haven’t told us. Friday – Declutter your socks and underwear drawers….this I’ll get back to on Friday. Saturday – Declutter, from your closet, this season’s clothes that haven’t been worn…this is one I keep doing. It’s mid-90s here with high humidity, so we’ll see what makes the cut by the time we FINALLY get cooler temps. Sunday – Declutter your craft/hobby area whether your choice of pastime is anything from woodwork to papercraft, sewing, knitting, gardening or even some kind of sport…this one I just actually put on my never-ending To Do list. I have a tote on top of one of the wardrobes that has crafty/sewing bits that I haven’t inventoried in a while. The Eco Idea: I use block cheese and slice or shred my own (hence the thumb). I have been using a ziplock baggie, but stopped myself this last block….I have empty Tupperware wasting air…let’s put one to use. Much better, less messy, and a better seal. I stopped buying pre-grated cheese when a friend of mine told me that (urban legend alert) the grated cheese is made of those blocks that are beyond expiration date and have spots and/or mould, which is only cut away and the rest gets grated and then packed again. That Even if this is not true, it prevents me from buying those plastic bags of pre-grated cheese. I buy blocks from the local cheese shop and slice/grate it myself. I feel safer, but thats always the case if you get unprocessed food. Aww thanks. I tend to get hurt when I do, but eh…. I first sliced my own after needing some and being lazy…BUT had a block in my fridge…also, it was cheaper. lol I started slicing my own cheese after I realized most of the slices said “Cheese food”. WHAT?!?! Ok….ummm, no thank you. The shredding came from laziness/cost. Soooo, the block is cheaper than a small package AND I have a grater at home? Yes, please. My food processor has a grater attachment…probably should have used that instead of slicing my thumb. Oh well. The only thing that’s difficult/a pain to clean is for mozzarella. Not sure what I’ll do when that time comes. Our food processor info said do not use on cheese. Right. We’ve used it for over 20 years to grate cheese–hasn’t broken it yet. I do cut the block up in maybe 1 x 1″ chunks first, like you would carrots or anything else. Use it all the time for pimiento cheese sandwiches, lasagna, etc. I do buy the shredded for some things, since it comes in a tasty 2% fat sharp cheddar. I love this blog, it keeps us thinking. Some local church women run a shop that does consignments–I sold some stuff there once–so have been making a list of stuff I didn’t exactly want to donate–like but no longer love like I once did– but I don’t have the time or energy to try and sell myself. This shop gets 40% which they donate to local causes, so if it sells I won’t feel bad about their 40%–just a win win for me (leaves my house and I get a little money). I had been wondering how I could do that and I remembered how easy that was, and how very nice the ladies are. Right now the car is full of stuff for the other thrift store which we will drop off Thursday.